Ignacio Labarthe, Veson Nautical, USA, explains how maritime software innovation is helping the LNG shipping industry to maximise efficiency. The deferment of LNG projects across the globe coupled with the oversupply of tonnage created by market conditions, speculation, and geographical events – not to mention the extremely low price of crude – has led to the demise of margins in the entire LNG value chain, hitting the LNG shipping vertical the hardest. New LNG production coming online in 2018 and beyond will likely alleviate this oversupply of tonnage and drive freight rates upward. Until then, however, it will be critical for companies to maintain acceptable profit margins that will allow for timely payment of debt covenants and stave off creditors and investors. Additionally, market trends are driving the industry to a more speculative and spot market, which can lead to a state of uneven cash flow generation for LNG companies, making relationships with creditors more difficult. With market conditions as they are, it is more important than ever for LNG enterprises to maximise efficiency and agility in all areas of their business. This shift towards short-term trading volumes due to tonnage oversupply, arbitrage opportunities across regions, increasing demand hubs, and market complexities is changing traditional buyer-seller relationships. As a result, this shift has driven LNG shippers to diversify their risk strategies, as they are quickly realising that favourable prices and optimised shipping strategies are obtainable in this way. With the recent introduction of a new voyage charter-party designed for the LNG spot market (LNGVOY) that addresses boil-off cap and heel terms among other variables, LNG shippers need to become more efficient in keeping track of an ever-increasing number of data points. They also need to react to these conditions by becoming more flexible and agile in order to make fast and accurate decisions based on this data. Figure 1. Average heel: keep track of heel amounts on delivery and how that compares to contracted amounts in order to price short-term contracts more accurately. Fortunately, there are mechanisms that can help companies maintain acceptable profit margins and positive cash flows, and eventually gain a competitive advantage. Maritime software solutions, when properly leveraged, can maximise efficiency across an organisation. These solutions have gained popularity in recent years, as the maritime industry has steadily and increasingly embraced technology. Cloud-based computing has become the standard for many business software systems, including platforms such as Salesforce, Microsoft Office 365 and the Adobe Creative Cloud, which are supported by readily available web hosting services, such as Amazon Web Services and Microsoft Azure. These solutions maximise agility, scalability, and access while minimising maintenance, upkeep and cost. Many offer built-in analytic platforms to enable more precise and profitable decisions. Instant accessibility on any device with an internet connection allows key players to have access to the right knowledge, enabling effective decision making anywhere, at any time. Most importantly, cloud software shifts the technical maintenance onus away from IT departments, allowing companies – including leaders in the LNG industry – to focus more on strategic business initiatives and providing users with the agility to adapt at a moment’s notice. Figure 2. 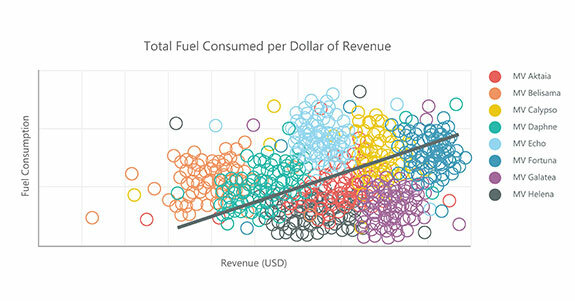 Total fuel consumed: have in depth visibility into how individual vessels are performing around the value of the fuel they are consuming versus the revenue they are bringing. Keep a tab on fuel expense versus revenue ratio for different type of vessel propulsion types or specific regional trades. When companies replace operational efficiency with operational agility, it frees them up to do interesting things with their data. When a company does not have to manage the technical aspects of their mission-critical software, they are granted the necessary time and resources to improve and grow their core business, bolstered by the actionable insights that come from a modern software platform. The LNG sector is perfectly poised to take advantage of the value provided by the increasingly available cloud-based software solutions designed for the maritime industry. The automation of performance monitoring via a cloud-based solution with built-in business intelligence can put critical data at users’ fingertips, enabling better and more profitable decisions. A holistic view of all fleet activity, including current vessel positions, up to date ETAs, and utilisation metrics, can find and fix profit leaks in workflows and allow for business process optimisation. A maritime-specific cloud application can provide LNG companies greater value with fewer resources by reducing time needed to make important decisions, providing a comprehensive overview into every part of their business, and offering all of its benefits without incurring significant capital investments or additional IT overhead. Figure 3. Vessel utilisation: capture a real time picture of commercial success across fleets and regional strategies through vessel utilisation metrics and real time off-hire figures. As LNG contracts continue to shift towards spot markets, LNG companies are compelled to optimise every aspect of voyage performance, pushing the need for analytical tools to the forefront. For example, accurately estimating boil-off gas (BOG) figures across different propulsion types and routes, as well as calculating the quantity of heel between employments are key variables that can dramatically affect both pre and post-fixture decision-making. To achieve this visibility, performance monitoring automation shifts from a secondary concern to a primary focus. Further, when this stream of data is connected to an intuitive, visual business intelligence dashboard, it delivers data in context to key users and allows them to make more profitable decisions. Having dashboards and visuals available to managers on demand helps to identify areas for improvement and opportunities to control costs, thereby maximising revenue even further. More importantly, the ability to forecast these figures accurately through the continuous flow of relevant data will enable visibility into the real-time operating economics of individual vessels, as well as the overall fleet. When such dashboards are available as a part of a cloud software solution, such as Veson Nautical’s Veslink Platform, users gain access to actionable insights at any place, at any time, on any device, increasing the pace of business to one that matches the current LNG market. The values and benefits derived from cloud computing and software tools expand beyond the day-to-day operations and into a more strategic space. Within LNG, vessel allocation and utilisation can be determining factors and major drivers of profitability. One of the largest benefits to a cloud platform is the flexibility and ease with which multiple sources of data can be imported, aggregated, and deployed for analysis. This scalable connectivity with counterparties and a data sources is the engine for online workspaces and tools that empower today’s traders, charterers, and risk managers to make the best long-term decisions. Figure 4. 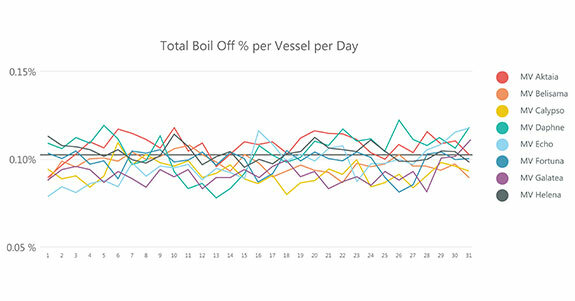 Boil-off over time: have real time visibility into how vessels are performing on a daily basis against boil-off thresholds in order to take immediate action and calculate potential claims. Solutions such as the Veslink Platform offer this connectivity, providing the ability to collect open vessel positions from multiple outside sources (e.g. brokers, trusted owners, etc.) and deliver them to your inbox, ready to be acted on based on your current exposure and tonnage availability. 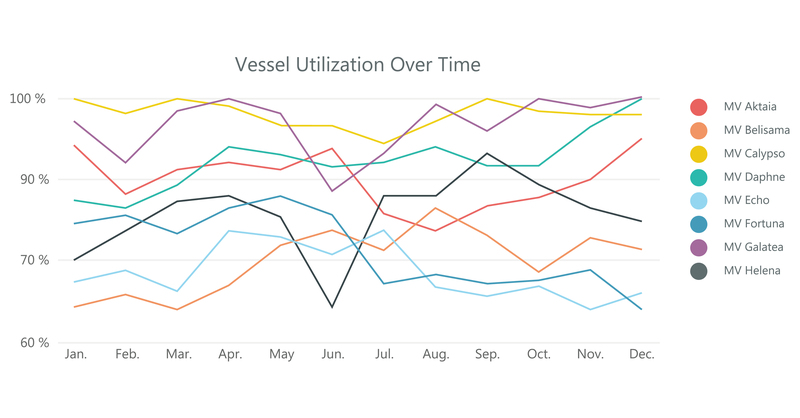 When you add in operational reports from vessels, historical and actual conditions from weather routing providers, and bunker prices, and you combine these external parameters with your own voyage results, you now have a full and dynamic dataset from which to calculate route profitability, seasonal trends, and more. This connectivity available through cloud solutions – this access to actionable intelligence and visibility to opportunities – is central to maximising profitability in a volatile market. The maritime industry is in the midst of an exciting, exponential growth period. The shipping industry – including the LNG sector – is undoubtedly rooted in tradition, but the increasing adoption of available technology will only help the industry continue on its growth trajectory. The innovative market leaders that adopt the latest technology will benefit from actionable insights derived from a holistic understanding of relevant data. The ability to combine different sources of data can yield insights into the allocation of capital investments given a combination of profitability and performance data, arbitrage opportunities, and potential returns. LNG shipping companies need a platform that will provide their teams with real-time visibility into tactical and strategic variables that will ultimately lead their business to become more agile, mobile, and flexible. A clear cloud strategy gives a company the flexibility and agility to execute on its desired strategies faster and more effectively than its competitors do. The move towards adopting proper maritime software will alleviate the cumbersome processes, fragmented data, and antiquated legacy systems that are limiting shipping companies today. In the past five years, the industry has made major strides in business system modernisation. For example, regulatory compliance reports can be generated out of a company management system, saving time from having to create them manually. Position lists have migrated out of the front pockets of chartering managers and now reside in public databases, such as the automatic identification system (AIS) – a culture of transparency has replaced the secrecy that once dominated the market. The adaptation of new technology for any company can be daunting; fear of the unknown can cause companies to think twice about the investment. Buy-in from senior stakeholders will take considerable time and effort, as will the evaluation process for the right solution. However, forward-thinking companies see IT as an enabler for effective scaling and continued growth. Successful companies have and will continue to embrace technology as a tool for advancement. In doing so, they set themselves up to make optimal business decisions at the pace of the market, causing them to rise above the competition and ultimately achieve success.